ST. GEORGE — The Bureau of Land Management-Utah State Office has posted a proposed list of 20 parcels, administered through the Richfield Field Office, for an upcoming quarterly competitive oil and gas sale lease, to be conducted via the internet. The auction is tentatively scheduled for June 12. 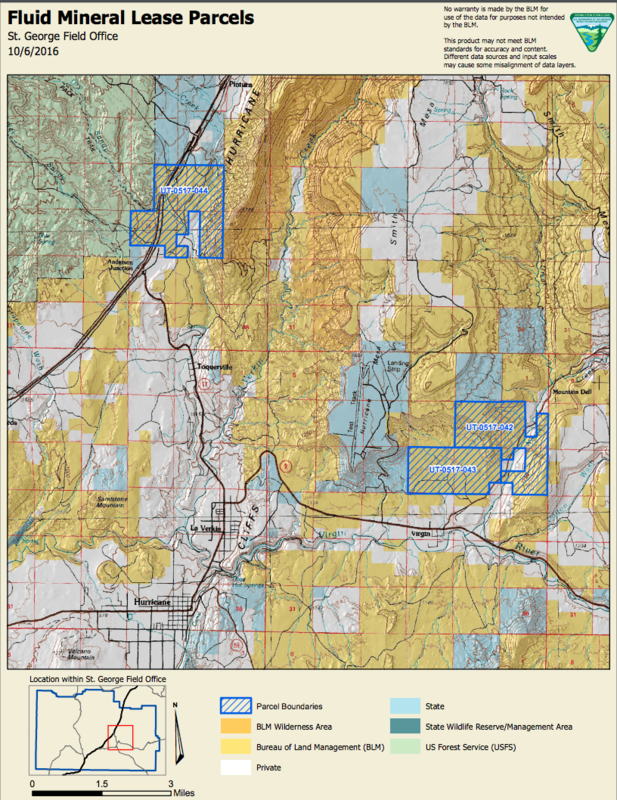 A map showing the 20 parcels for sale, collectively encompassing approximately 23,733 acres in Garfield, Piute, Sevier and Sanpete counties, can be viewed in the map inset to this report. Additional information about the parcels is included on the National Environmental Policy Act project page of the BLM’s National NEPA Register for the June 2017 proposed sales online. Included are maps, the environmental assessment and unsigned Finding of No Significant Impact. The sale will be conducted utilizing the EnergyNet internet-based auction system. Additional details about the internet auction process are included in the Notice of Competitive Lease Sale documentation online. This proposal opens a 30 day protest period. Protests must be received before 4:30 p.m. on April 10. Protests should be as specific as possible. Those which contain only opinions or preferences will not receive a formal response, but may be considered in the BLM decision-making process. A statement of reasons to support the protest. A statement of the interest of the protesting party in the matter. Signature of the party submitting the protest; if the party signing the protest is doing so on behalf of an association, partnership or corporation, the signing party must reveal the relationship between them. For example, unless an environmental group authorizes an individual member of its group to act on their behalf, the individual cannot make a protest in the group’s name. The name and address of the protesting party. The protest must be received by the BLM timely, that is by 4:30 p.m. on April 10, via mail or fax as specified below. The BLM will dismiss a late-filed protest or a protest filed without a statement of reasons. Reference the “June 2017 Oil and Gas Lease Sale” when submitting protests. Alternatively, written protests may be faxed to the attention of Sheri Wysong at fax number 801-539-4237. Protests submitted in any other manner than by mail or to the fax number indicated above will not be considered, Venhuizen said. 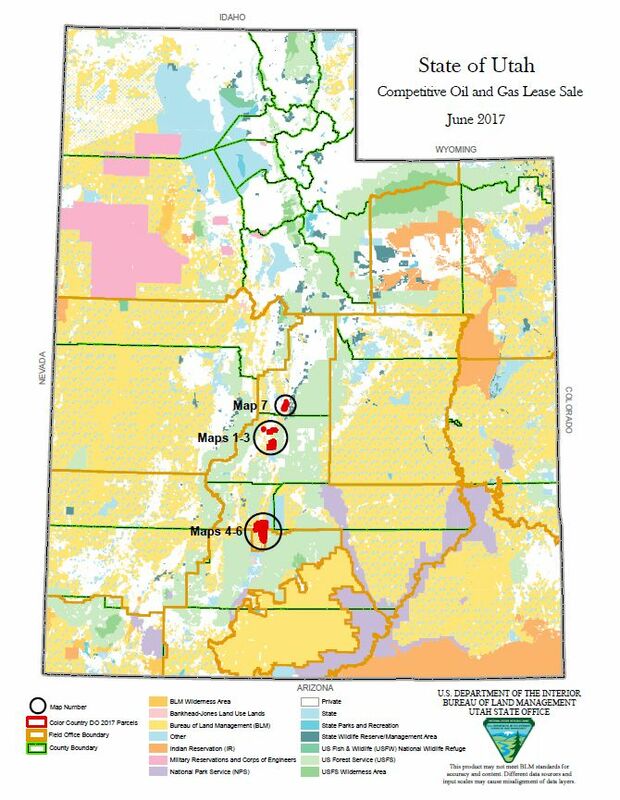 For more information on how to file a timely protest, the BLM’s notice refers to its June 2017 Notice of Competitive Lease Sale, which can be accessed online. Hard copies of the sale notice may also be obtained in person from the BLM-Utah State Office Public Room at the address listed above. Before including an address, phone number, email address or other personal identifying information in any protests or comments, be aware that the entire submission — including personal identifying information, names and street addresses — will be made available for public review. For further information regarding the sale, contact Sheri Wysong at telephone 801-539-4067. Persons who use a telecommunications device for the deaf may call the Federal Information Relay Service at telephone 800-877-8339 to leave a message or question for Wysong. The FIRS is available 24 hours a day, seven days a week. Replies are provided during normal business hours. Ed. note: UPDATED March 15, 2017, to include more particular instructions for submitting protests.